Click the Charts tab at the top of the Quick Analysis options palette. 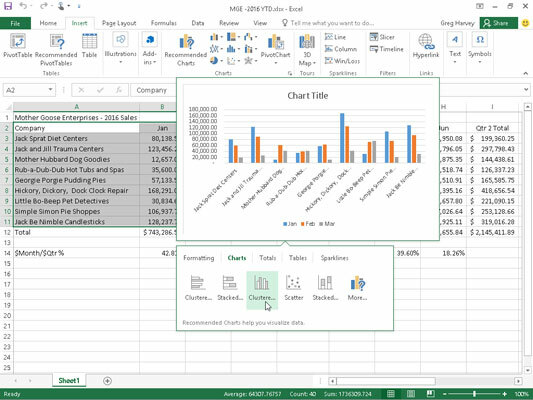 Excel selects the Charts tab and displays its Clustered Bar, Stacked Bar, Clustered Column, Scatter, Stacked Column, and More Charts option buttons. The first five chart type buttons preview how the selected data in a different type of chart will look. The final More Charts button opens the Insert Chart dialog box with the Recommended Charts tab selected. Here you can preview and select a chart from an even wider range of chart types. 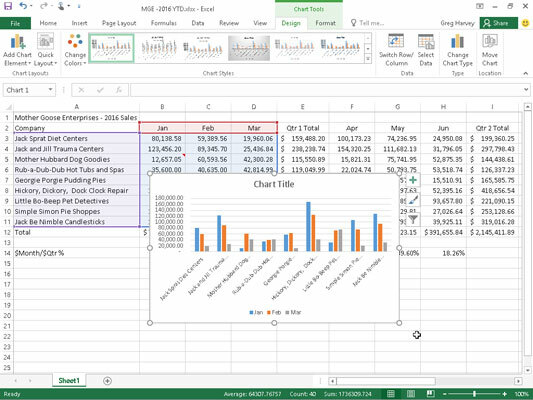 In order to preview each type of chart that Excel 2016 can create using the selected data, highlight its chart type button in the Quick Analysis palette. As you highlight each chart type button in the options palette, Excel’s Live Preview feature displays a large thumbnail of the chart that will be created from your table data. This thumbnail appears above the Quick Analysis options palette for as long as the mouse or Touch Pointer is over its corresponding button. When a preview of the chart you actually want to create appears, click its button in the Quick Analysis options palette to create it. Excel 2016 then creates a free-floating chart (called an embedded chart) within the current worksheet. This embedded chart is active so that you can immediately move it and edit it as you wish. The following figures show you how this procedure works. Here, only the first quarter sales figures (with their column headings) are selected in the much larger YTD spreadsheet. Previewing the clustered column chart to be created from the selected data via the Quick Analysis tool. After selecting the range and clicking the Quick Analysis tool that appears in the lower-right corner of the cell selection, click the Charts tab and then highlight the Clustered Column chart type button in the Quick Analysis tool’s option palette. The previewed clustered column chart then appears in the thumbnail displayed above the palette. This figure shows you the embedded chart created by clicking the Clustered Column chart type button in the Quick Analysis tool’s palette. Embedded clustered column chart after creating it in the worksheet with the Quick Analysis tool. When first created, the new chart is active and its chart area is automatically selected. When this is the case, you can move the entire chart to a new part of the worksheet by dragging it. While the chart area is selected, Excel outlines and highlights the data represented in the chart in red for the headings used in the chart legend; in purple for the headings used as labels along the horizontal, Category, or x-axis; and in blue for the values represented graphically by the bars in the chart and in the vertical, Value, or y-axis. In addition, the Chart Tools contextual tab with its Design and Format tabs are added to the Ribbon, and the Design tab, with its options for making further design changes, is selected.